The iPhone X is one of the most high-end and desirable phones on the planet, but it’s now got some serious competition in the form of the Samsung Galaxy S9. The two phones have a number of similarities, including their OLED screen technology and focus on photography, but there’s a whole lot more that’s different. So, to help you decide which of these to buy, we’ve put the two handsets head to head, comparing their design, screen, specs, cameras and battery. Watch our hands-on video with the Samsung Galaxy S9 below. The Samsung Galaxy S9 has a high-end but familiar design, with a glass back, a metal frame and a curvy screen, similar to the Galaxy S8. It has small bezels above and below the display and it’s IP68 certified, meaning it can be submerged up to 1.5 meters deep in water for up to 30 minutes. The iPhone X meanwhile was a completely new design for Apple and in some ways it arguably looks more modern than Samsung's effort, with even less bezel on the front, and instead just a small notch jutting into the screen. Its screen is flat though and it too has a glass back and a metal frame. The iPhone X is also water resistant, but it’s only IP67 certified, meaning it can be submerged up to 1 meter deep for up to 30 minutes. The Samsung Galaxy S9 is slightly larger and thicker than the iPhone X, but not as wide, at 147.7 x 68.7 x 8.5mm to the iPhone X’s 143.6 x 70.9 x 7.7mm. At 163g, the Galaxy S9 is lighter than the 174g iPhone X. One thing that might work in the Galaxy S9’s favor depending on whether or not you’re happy to go wire-free is that it has a headphone port, which the iPhone X doesn’t. Both the Samsung Galaxy S9 and iPhone X have 5.8-inch Super AMOLED screens with wide aspect ratios (18.5:9 in the case of the S9 and 19.5:9 in the case of the iPhone X), but they also have a lot of differences. For one, the Galaxy S9’s screen is slightly curved while the iPhone X’s is flat, but the iPhone X has less bezel around its display, relying instead on a notch to house the front-facing camera and sensors. The Samsung Galaxy S9 has a higher resolution screen at QHD+, while the iPhone X’s is a little below QHD at 1125 x 2436. Though Apple’s screen does sport 3D Touch, allowing it to judge different levels of pressure so it can respond differently to a light press or a hard press. It’s a great screen overall as our review attests, and the Galaxy S9’s sounds great too but we’ll let you know exactly how good it is once we’ve had a chance to fully test the phone. Check out our overview video of the iPhone X below. The Samsung Galaxy S9 has 4GB of RAM and either an octa-core Exynos 9810 chipset with four cores clocked at 2.7GHz and four running at 1.7GHz, or an octa-core Snapdragon 845 chipset with similarly fast cores. Which chipset you’ll get depends on where you are – it’s Snapdragon in the US and Exynos in most other places, but both of them are top-end chipsets. The iPhone X on the other hand has 3GB of RAM and a 2.39GHz hexa-core A11 Bionic chipset, which is also top-end. It’s unknown yet which is the most powerful but neither of these phones should feel slow at all. As for the OS, you get Android Oreo on the Samsung Galaxy S9 (overlaid with Samsung’s own interface) and iOS 11 on the iPhone X. The differences between Android and iOS are well-documented, but in both cases you’re getting the latest, most polished version of the operating system. There are also some differences in storage – the Galaxy S9 comes with 64GB built-in along with a microSD card slot, while the iPhone X comes with a choice of 64GB or 256GB, but there’s no microSD card slot. In our review we praised the iPhone X’s cameras and there’s a good chance we’ll be doing the same with the Samsung Galaxy S9, because the company has clearly put a lot of effort into them. The S9 has a 12MP camera on the back and while it has just a single lens it can switch between two different apertures. There’s f/2.4 which is what you’ll probably want to use in daylight, and f/1.5 which is better for low light scenes. That latter aperture is the highest ever on a smartphone, and the camera also has optical image stabilization (OIS), to help keep shots blur-free. The iPhone X meanwhile has a dual-lens 12MP camera with one f/1.8 lens and one f/2.4 lens. It also sports OIS and we’ve found it to be a capable low light shooter. Another thing Samsung has focused on with its camera is slow motion shooting, allowing you to shoot at up to 960fps, compared to just 240fps on the iPhone X. The Galaxy S9 also has a similar-ish feature to Apple’s Animoji called AR Emoji, letting you create an emoji of your face and have it mimic your expressions. That’s powered by the 8MP f/1.7 front-facing camera, while the iPhone X has a 7MP f/2.2 one. Battery-wise you get a 3,000mAh unit in the Samsung Galaxy S9, capable of both wireless charging and fast charging. The iPhone X meanwhile has a smaller 2,716mAh one, and also supports wireless and fast charging. In our review we found its life was average, but it remains to be seen whether the slightly larger battery in the Galaxy S9 will translate to longer life. 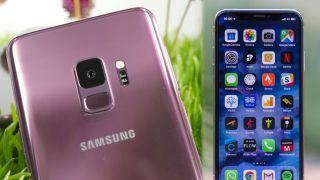 If it lives up to its specs the Samsung Galaxy S9 looks set to be one of the best phones around, just like the iPhone X, but choosing between them could come down to what you want from your handset. The choice of Android or iOS is a big one of course, but expandable storage, a variable aperture and a curvy screen among other things could push you towards the Galaxy S9, while the absence of bezels and the extra camera lens are both things in the iPhone X’s favor. One thing’s for sure, you’re going to have to spend a lot either way, £739 for the S9 ($719, AU$1,199) - though we expect a lower official price) so you might want to wait for our full Samsung Galaxy S9 review before making your final decision. Not sold on either? Check out the best phones you can buy right now.